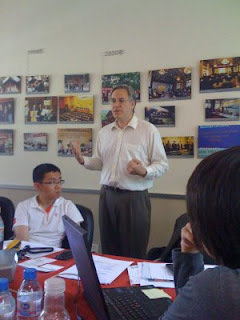 On a lovely spring afternoon on the beautiful campus of Peking University, Bill Russo addressed the 2009 Beijing International MBA class on the topic of "The Impact of the Global Economic Crisis on China's Automotive Industry". View more presentations from Bill Russo. GlobalAutoIndustry.com Publication of "The Coming Structural Realignment of China's Automotive Sector"
We are fortunate to be living in historic times. While in the grip of the most severe economic contraction since the 1930s, it is in such times – and only in such times ‐ that truly transformational structural change is possible. While much has been said and written about the rapid emergence of China as the largest automotive market in the world, this obscures the reality of just how many structural problems remain unsolved in an industrial sector that China describes as a “pillar” of its economy. In this first article in a 3-part series on the China auto industry, Bill Russo describes how the global financial crisis will be the triggering event that precipitates a major restructuring of the Chinese automotive sector. View more documents from Bill Russo.